What's New: New! 1. Redesigned and improved program interface 2. Open html file after export 3. New parameters and templates are added 4. Bug fixes. This download (deluxe-menu.zip) was tested thoroughly and was found 100% clean. Click "Report Spyware" link on the top if you found this software contains any form of malware, including but not limited to: spyware, viruses, trojans and backdoors. Page Popup Maker 2.0.2 - Create popups - page load/close, links, form buttons mouse over, image links. 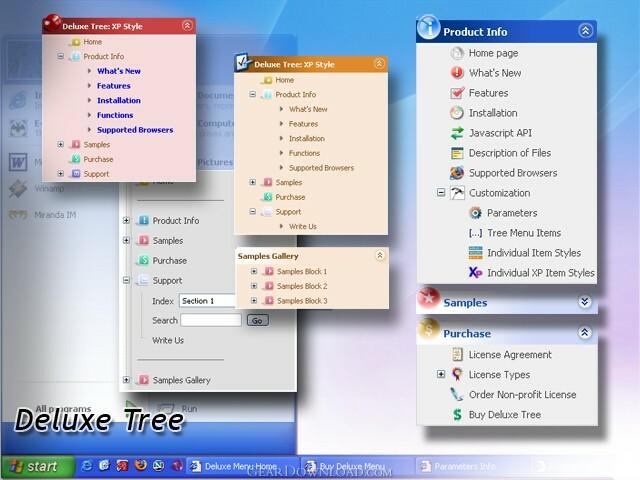 Likno Drop Down Menu Trees 1.1.152 - Likno Drop-Down Menu Trees - powerful html menu trees creation!